Part of the appeal of any small city's downtown are the small locally owned shops that you can't find anywhere else. Grand Forks, like every other small city, has its own shops and one of my favorites is Widman's Candy Store. Widman's has been a staple in Grand Forks since 1949, and survived having 4' of water in the shop in the flood of 1997. 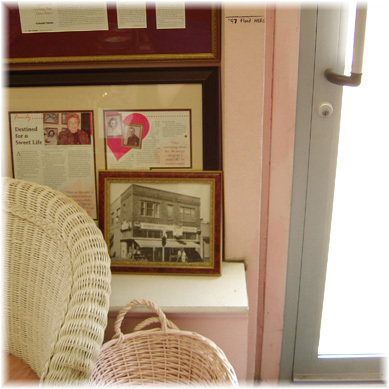 Widman's boasts 4 generations of candy makers, starting in St. Paul with George Widman's grandfather and currently the newest Widman's Candy Store is run by Carol Widman, George and Betty's daughter, in Fargo. Generations of Widman's candy makers: This past Saturday we went downtown to the local Farmer's Market at Town Square, and then wandered down 3rd street to the Metropolitan Opera House for some picture taking. While we were down there we ducked into Widman's and picked up some Blueberry Zingers (chocolate covered blueberries), which disappeared quickly once hubby opened them (he LOVES blueberries). 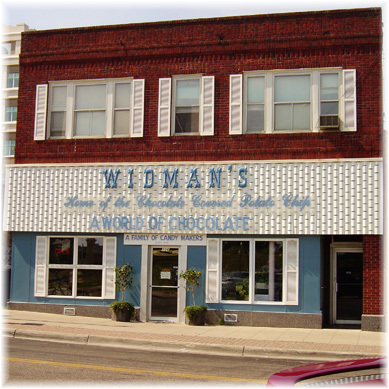 The exterior of Widman's: Hubby likes Milk Chocolate and I like Dark Chocolate. I prefer fondants and caramels, he prefers nuts and coconut. 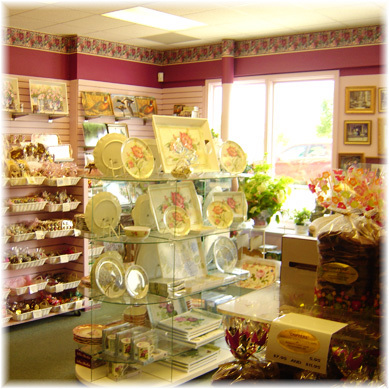 Widman's has it all. They also have a selection of gift items, beautiful trays, plates and cups. Perfect for adorning with a selection of chocolates and serving. While I was there I asked George Widman if I may take a few pictures inside the store. He said of course, as long as I didn't take a picture of him. I did happen to capture him in a picture, he was behind the counter and I had to have a picture of the counter! I don't know if he was serious, but just in case he was I've only pulled out a bit of the counter, so I am not putting him on the web. So you only get to see about a third or maybe a fourth of the candy counter. 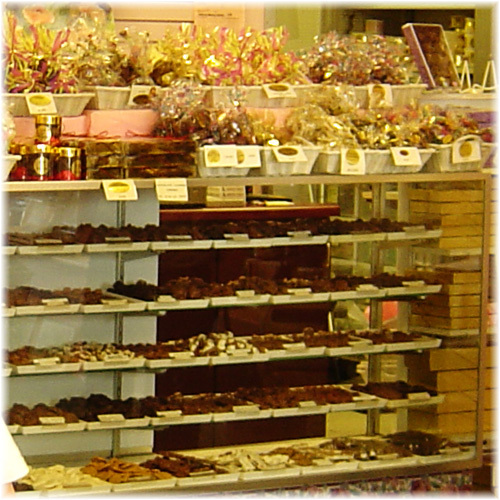 The other end of the counter is topped with jars of a variety of non-chocolate candies. Behind the counter is tray after tray of decadent chocolate goodness. Everytime I go in I get something different always coated in a delicious dark chocolate. 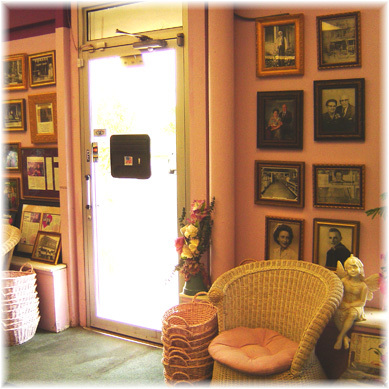 Here is a lovely article about Widman's by John Gilbert if you'd like to read more. The chocolate covered blueberries sound amazing. I'm w/ your Hubby, coconut and nuts in milk chocolate please. It all sounds like a really nice time. The walk, the candy store, the lovey man by your side - and of course the blueberries. I also adore the little baskets at the door of the shop. ... it's all your fault. It's all about the details. Actually when we were there, there were about 6 other people there at the same time, and 1 of the ladies was walking around with 1 of those baskets heaped. I was timing my photos to try not to get people in them. Since it's a smaller space it would take up most of the shot. Oh yum!!! I'll take some of the fondants and caramels with the milk chocolate!! What a quaint candy store! They have plenty... :) I can send you some sometime. I live over 1500 miles away now, when I saw the pics of the shop I could almost smell the chocolate. I'm so glad they take mail orders! While most GF'ers will say they like the chippers the best (did I miss it or didn't you mention them? ), my sister Kathryn used to work at the Fargo location and says she likes the chocolate covered gummi bears the best. To which I say, not so much!! I sent a 1# box of chippers to both sets of parents for Christmas 07. My stepmom sent me an email and told me next time to send some for both her and my dad. :) Guess they like them, too!